Eliminates the need to climb a ladder and clean your gutters! 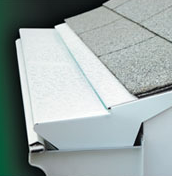 Leafproof doesn't screw into the roof like other gutter covers, so roof leaks are eliminated! Gutter protection is a mechanical way of pest control which reduces the amount of chemical pest control needed. These gutters will prevent ants and mosquitoes from nesting in clogged gutters.